Before ordering our first course we started with a cocktail each. We ordered the Botanist Martini (Botanist Scotish Gin, Vya Dry Vermouth, Orange Bitters and Blue Cheese Olives) and the Sassi-Tini (Ultimat Vodka, Blue Cheese Olives). Both drinks were made to perfection and poured table side. What stood out most in both drinks were the hand stuffed blue cheese olives. 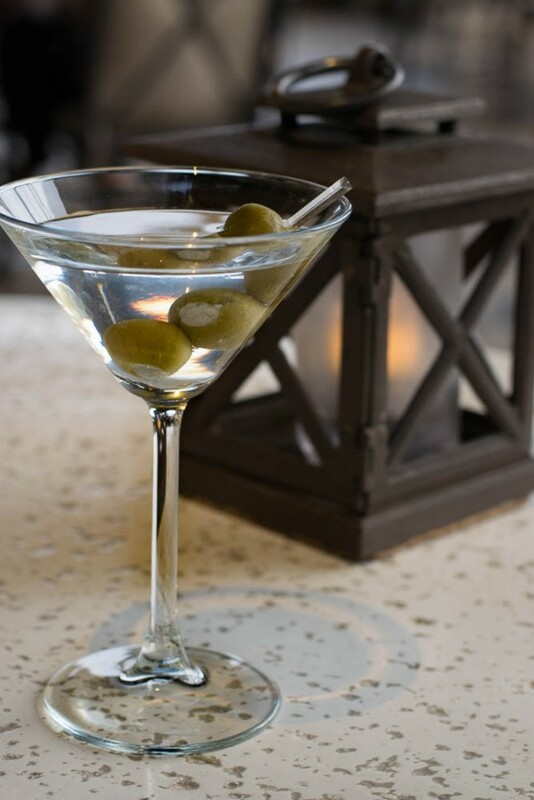 Hand stuffed blue cheese olives are not uncommon in nicer restaurants, but Sassi makes theirs a bit differently by using gorgonzola instead of the typical Maytag Blue. This created a bit of a briny taste reminiscent of the ocean. For our appetizers we chose the Three Formaggi (The Geeks not order cheese? Not likely) and at Chef Nicosia’s recommendation, the Wood Grilled Octopus (truth be told we were already going to order it). The Three Formaggi features a trio of cheeses (Cypress Grovers Bermuda Triangle, Gorgonzola Dolce, and Parmigiano Reggiano), a slice of grilled garlic bread, and candied walnuts. All of the cheeses were excellent but the grilled garlic bread was the true star of the show. You could actually smell and taste the smokiness of the grill which when paired with the cheese, was delightful. 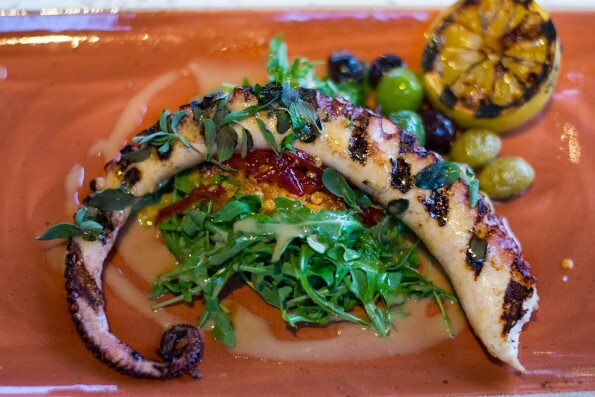 Chef and guest favorite alike, the Wood Grilled Octopus is a must order at Sassi. Cooked with wine corks (a traditional method believe it or not), Chef Nicosia told us that they go through 100 pounds of it a week. It is no surprise to us that this is the case. Octopus is very difficult to cook without it getting too tough but Sassi’s does not suffer this fate. It is served over an arugula salad topped with crispy lentils and candied chilies. The combination of the bitterness of the arugula, the crunch of the lentils, the sweetness of the chiles and the salty, tender octopus is out of this world amazing. Our first course was paired with a 2014 Pieropan Soave Classico. The Sassi Wine Steward Veronica Trujillo, selected the creamy white wine for its ability to stand up to the gorgonzola and octopus. Next we tried a few of the handmade pastas that Sassi has to offer. All of the pastas at Sassi are made in house. We tried the Saffron Cavatelli and the Oricchiette (Chef Nicosia’s favorite). Initially we only had ordered the Cavatelli but due to it being the Chef’s favorite, it was sent out to us as well. Not uncommon for us, we each had our favorite; Matthew with the Oricchiette and Sarah with the Cavatelli. The Oricchiette is served with Sassi sausage, rapini, chilies and pecorino. The rich flavors of the pecorino and the bitterness of the rapini take this pasta dish to the next level. It is a great choice if you don’t like pastas with a tomato based sauce. 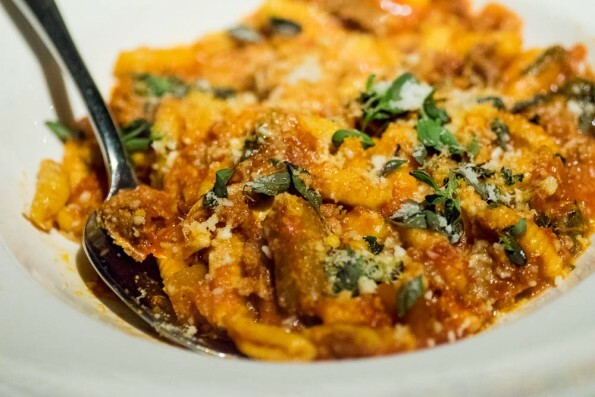 The Saffron Cavatelli is served with a pork ragu, pecorino and marjoram. The marjoram provides a big, bold flavor and the tomato sauce is not too acidic. In both pastas, the pasta itself was cooked to a perfect al dente and hold up to the sauce without getting mushy. Paired with our pastas was a 2009 Fanti Brunello di Montalcino. The wine was well balanced and paired beautifully with both pastas. Following our pasta courses we ordered the Colorado Lamb Due Sapore and Local Turnips. An order of lamb is comprised of three wood grilled lamb chops, house made sausage, and cauliflower caponata. We chose a side of the turnips to go with the lamb because they seemed to be the most interesting side. They are topped with anchovies, garlic, chilies, and oregano. One might not think that turnips and anchovies mix, but let us tell you, they do! The lamb was fantastic! Its preparation really let its flavors come out and it didn’t have to compete with the rest of the entree. The cauliflower caponata served with the lamb chops provided additional depth to the dish. 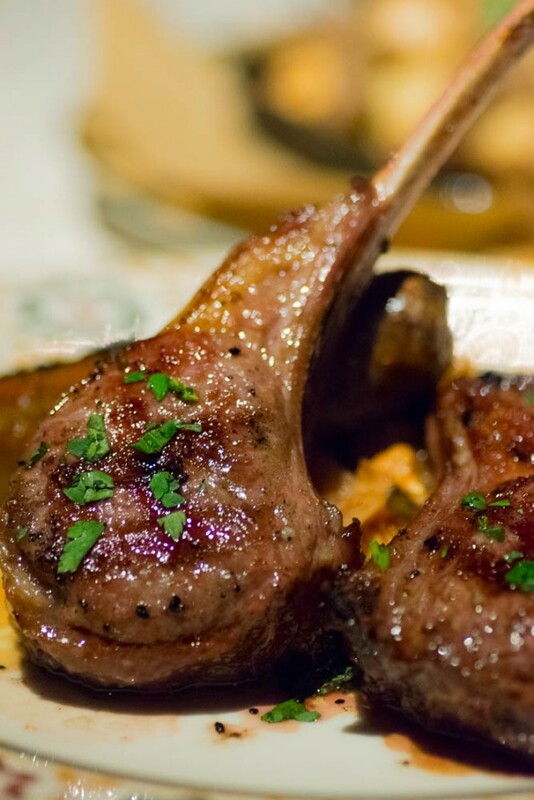 The wine pairing for the lamb and turnips was a 2013 Pio Cesare Barbera D’Alba, which as Veronica explained, is quite strong on its own and isn’t a wine you’d necessarily want to drink without food, but when paired with an entree like lamb or the bold turnips its flavors enhance the meal. As if all of that food wasn’t enough (we definitely had leftovers), we moved on to dessert. We took the suggestion of our server Joseph and ordered the House Cannolis. The cannolis were light and packed full of flavor including notes of citrus. Speaking of citrus, we tried a flight of the ‘cellos made in house. Currently Sassi is offering: Lemon (classic flavor), Pineapple (had a great nose and smelled exactly like cutting into a fresh pineapple), Strawberry Rhubarb (perhaps the most dangerous as there was little to no alcohol flavor), Apple Spice (didn’t come with too much apple flavor, rather it had a pleasant cinnamon note), Kumquat (the most unique flavor of the bunch), and Lime (very tart and smelled exactly like a lime runt, which is not a bad thing). Being the coffee (actually espresso) lovers that we are, we also made sure to order their espresso which was some of the best espresso we have had in the Valley. 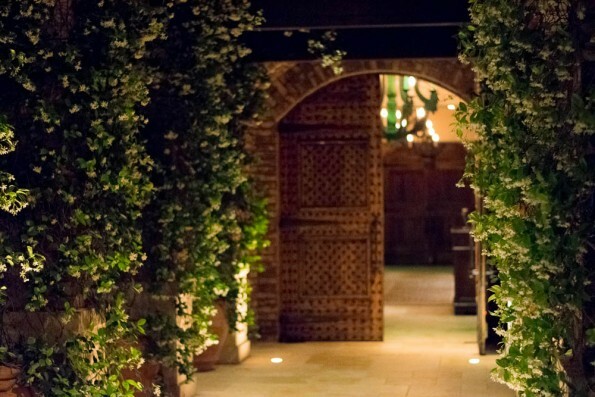 If you’re looking for romance, stunning views of the valley, and incredible food, Sassi is the place to go. The restaurant runs like a well oiled machine. The entire experience is phenomenal due to not only great food but also the impeccable staff. Every question was answered and if the server didn’t know, he would ask and quickly return with the answer. We can’t can’t speak enough praise for our meal. 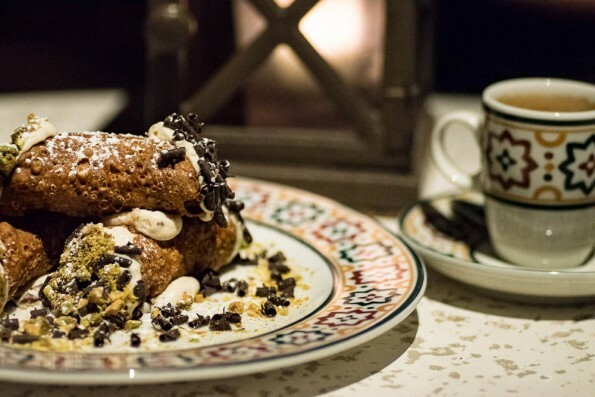 It is very easy to get lost in the magic that Sassi has to offer and surely, if you visit, you will fall in love with one of Scottsdale’s most romantic restaurants as well.